It's finally spring, and that means the Grand Rapids Fifth Third River Bank Run, the largest 25K in the country, will attract participants and spectators from across the globe. But those native to West Michigan have a particular advantage during the training process: a network of smooth, paved trails that stretch for miles. Prepping for another crack at the famous 25K, three dedicated local runners describe their love for the sport and the opportunity to train on trails that provide varying course lengths, scenic views and diverse topography. The Grand Rapids Fifth Third River Bank Run is the largest 25K in the country. Attracting participants and spectators from across the globe, the 38-year-old event offers newcomers and long-time runners an opportunity to race—and to train—alongside others passionate about the sport. Those native to West Michigan have a particular advantage during the training process: a network of smooth, paved rail trails that stretch for miles. Prepping for another crack at the famous 25K, three dedicated runners describe their love for the sport and their unique opportunity to train on trails that provide varying course lengths, scenic views and diverse topography. Linnae Satterlee"Apparently I'm a distance runner," says Linnae Satterlee, who took up the sport at age 41. Dabbling at the gym twice a week when her youngest child entered preschool, Satterlee soon participated in the River Bank Run 5K, the 10K, and the Grand Rapids Foster Swift Half Marathon. After a short time, Satterlee realized, "I'm totally bored with this," and sought to run the more challenging 25K. However, this long distance running required support, and Satterlee soon sought out Grand Rapids support groups that utilize the city's many trails to train together. 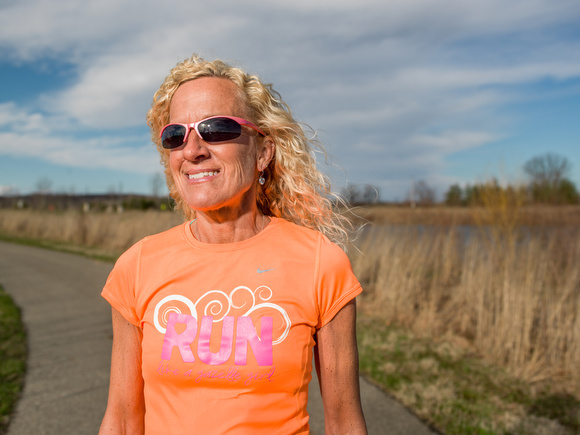 After joining the Grand Rapids Running Club, Satterlee began training with the group near John Ball Park and on the Fred Meijer Millennium Park Trails. "It's a convenience thing. It's a go-to for me," she says of Millennium, with its entrance just inside Walker city limits near O'Brien and Butterworth roads. On her own, Satterlee also frequently uses the Fred Meijer White Pine Trail for the longer distances and scenery. "It's very breathtaking," she says. Overall, Satterlee favors training on the trails for quiet of nature. "I much prefer it over the roads because it's so much more peaceful," she says. In addition, "you can create any type of distance you need," with miles of flat surface at her disposal. With or without a group, Satterlee appreciates the diverse trail systems available for her five-month training schedule for her sixth 25K (she is a River Bank Run Road Warrior and has been training with the group since December). "There's just a huge array of options," she says. Scot UrsumA fifteen-year veteran of the River Bank 25K, Scot Ursum relies on West Michigan's trails for running and training year round. 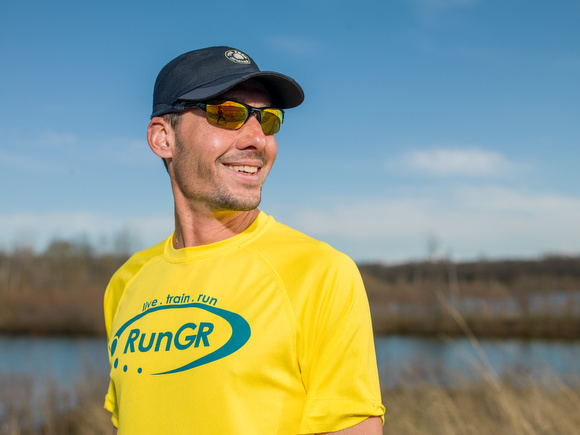 "The trails around GR are a common resource for me," says Ursum. Utilizing multiple trail systems, he values each for its unique characteristics: the Kent Trails for their farm country setting, the Fred Meijer M-6 Trail for its rolling hills, and the Paul Henry Thornapple Trail for its convenience near his work. Most of all, Ursum enjoys the ability to train apart from passing cars. "It's nice to get away from traffic and noise," he says. In addition to training solo, Ursum also serves as the membership director for RunGR, and runs weekly with its 250 members. The group runs together each Tuesday and Thursday on Reeds Lake Trail in East Grand Rapids, a scenic path that snakes around the lake, with a trailhead on Reeds Lake Boulevard. In addition to its urban location, "[the] terrain is good for running," says Ursum. With a varied topography of boardwalk, trail, dirt, hills and flat land, Reeds Lake Trail offers trainers a thorough workout for the River Bank Run's hilly route. In addition, "there are always a ton of people using it," says Ursum, reflecting that the camaraderie of other runners offers great motivation. Kaitlin Hoines, also a RunGR member and a four-year veteran of the River Bank 25K, agrees that Reeds Lake Trail is a perfect running course for a four-mile loop. "It's a challenging course," Hoines adds, but reflects that "the power of running with a group" makes it all the better. After beginning to run longer distances three years ago, Hoines realized she needed support to achieve her ultimate goal. "Training for my first 25K would not go well on my own," Hoines says. Since joining RunGR in 2012, she's discovered the support of running with a group and the benefits of running off-road. Much like Reeds Lake Trail, many of West Michigan's trail systems allow runners space and varied topography. "I prefer whenever I can to get on to a softer surface," says Hoines. Often seeking a break from the hard, flat surfaces of cement and asphalt, Hoines treks parallel to the trail in the grass or dirt. In particular, she enjoys running through the grass on the White Pine Trail, throughout the trail's 93 miles, and on her favorite stretch from Belmont to Cedar Springs. "That's always one of my favorite long runs," she says. Utilizing months of training and her years of experience in the race, Hoines will serve as a pacer for this year's 25K, assisting her fellow runners in maintaining their own strides throughout the fifteen-plus miles of the course. As the Fifth Third River Bank Run draws near, these runners and many others will finish their training routines and look forward to race day. On race day and beyond, many of these long distance runners will continue to take advantage of training on unique trails that allow for varied distances, softer surfaces and dedicated running groups.